Polycarbonate windows are ridgid windows made of clear polycarbonate plastic instead of the soft vinyl window material. These windows have the highest transparency of any window we make at Concord Custom Canvas. 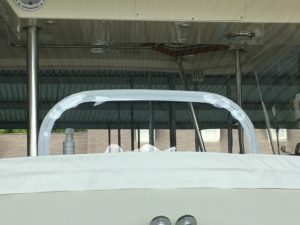 These windows are most commonly seen on the flybridges of large yachts. Concord Custom Canvas uses Makrolon AR2 Polycarbonate material in its rigid windows. Makrolon AR2 abrasion resistant polycarbonate offers superior abrasion resistance and glasslike surface hardness, along with the impact strength of polycarbonate. It features a unique clear hard coat finish that resists all types of abuse, from physical attack to chemicals and spray paint. Additionally, Makrolon AR2 offers resistance from yellowing and hazing for longer service life in high profile applications. Canvas: Polycarbonate windows are made of a durable high-strength canvas such as Stamoid or Sunbrella. 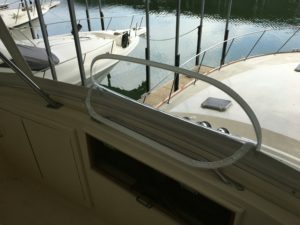 Windows are attached to the boat using zippers or metal hardware (such as snaps). Vents: Vents can be incorporated into rigid windows. Concord Canvas does this by incorporating a section of clear soft vinyl that can be unzipped and rolled down. 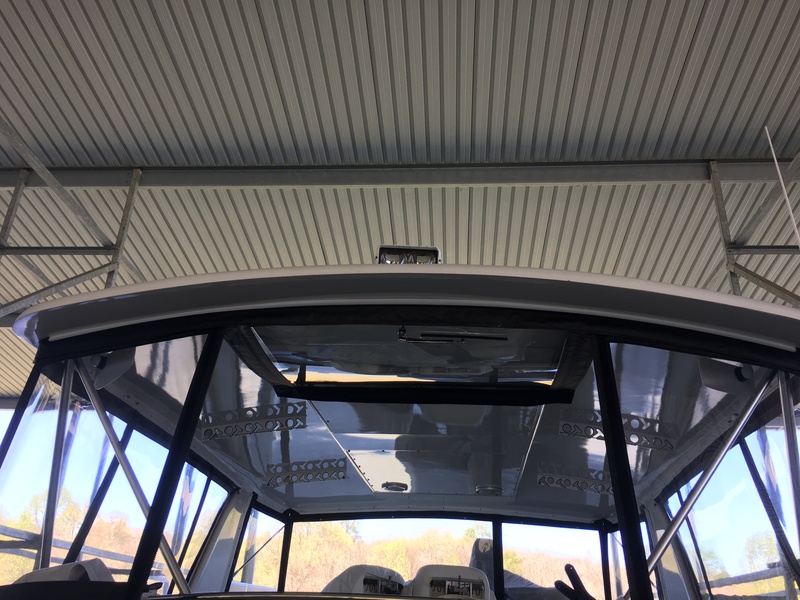 Flip-up stowage: Hardware can be installed on the top of the flybridge enclosure that secures the window in the open position. To operate this type of window, the side and bottom zippers are unzipped and the window is pulled into the bridge. 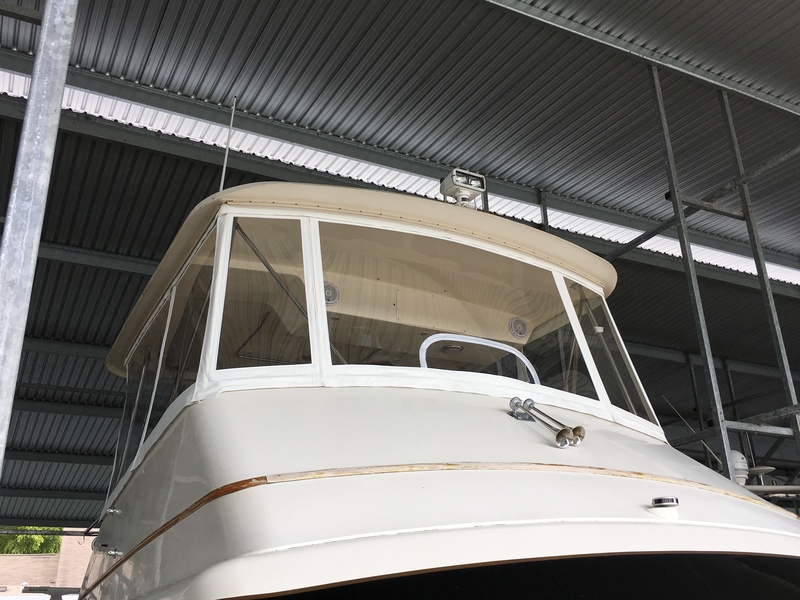 The window is attached to the top of the flybridge by way of snaps or lift-the-dot fasteners. 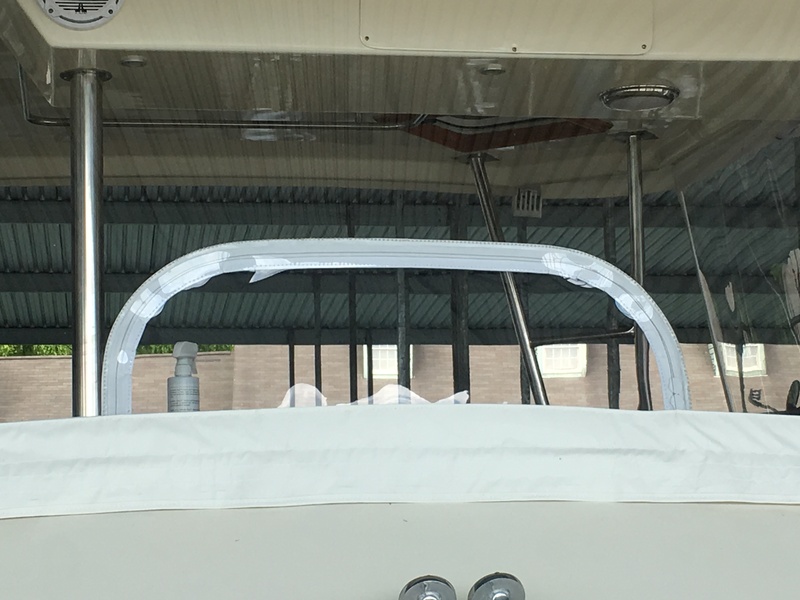 Rigid Window Flipped-up and stored on the underside of the flybridge top.